We are very excited about this new segment called “Church Etiquette and Language” where we will be sharing important information about the Oriental Orthodox Churches. Community confession takes place, followed by Holy Communion where the Priest serves unleavened bread dipped in wine which becomes the Body and Blood of Jesus Christ. Fasting before receiving Communion is required. Women should cover their heads to approach the alter. Men and Women may participate together. Private confession may be practiced between parishioner and priest. Leavened bread and wine become the Body and Blood of Jesus Christ; though they are administered separately – Body first, then Blood. Women and Men form separate lines – Men go first, then Women. Private confession is also practiced. Community confession takes place, followed by Holy Communion where the Priest serves commixed bread and wine which becomes the Body and Blood of Jesus Christ. Fasting before receiving Communion is required. Women should cover their heads to approach the alter. Men go first followed by Women in terms of line and order. Private confession is also practiced. Leavened bread and wine become the Body and Blood of Jesus Christ. The wine is specially made and cannot be bought in the store. Body and Blood are administered separately. 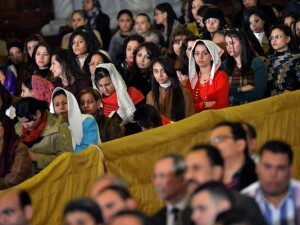 Women and Men form separate lines, where Women receive Communion first. Private confession is also practiced. Women: Proper dress consists of sleeved dress or blouse, and a hat or other head covering at all times, most especially when approaching the alter for Holy Communion. Men: Always wear a jacket, and no head covering or hat. Women: Proper dress consists of sleeved dress or blouse, and a head covering (scarf) at all times. No shoes should be worn in church. Men: Always wear a jacket, and no head covering or hat. No shoes should be worn in church. 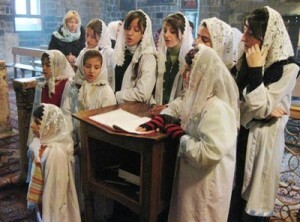 Women: Proper dress consists of dress or blouse, and a head covering at all times, most especially when approaching the alter for Holy Communion. No shoes should be worn in church. A white garment called a gabi or shamma is wrapped around the body over one’s clothes. Women must cover their heads. No shoes should be worn in church. Name: A bishop is addressed at Srpazan Hayr. A celibate priest is addressed as Hayr Sourp. A married priest is addressed as Der Hayr. 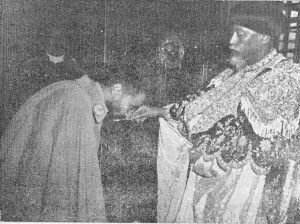 Greeting: Asdvadz Oknagan (bless me), Srpazan Hayr/Hayr Sourp/Der Hayr as well as a bow to kiss his anointed hand. One should not kiss his ring. Name: A bishop is addressed as Sayedna (master). 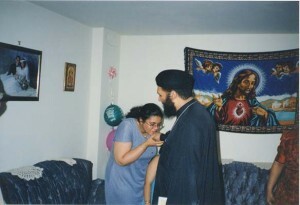 A celibate or married priest is addressed as Abouna (father). You’ll also sometimes hear Copts refer to their bishops and priests as Ne’yaftak (“Your Eminence”) and Odsak (similar to “Reverend”) respectively. 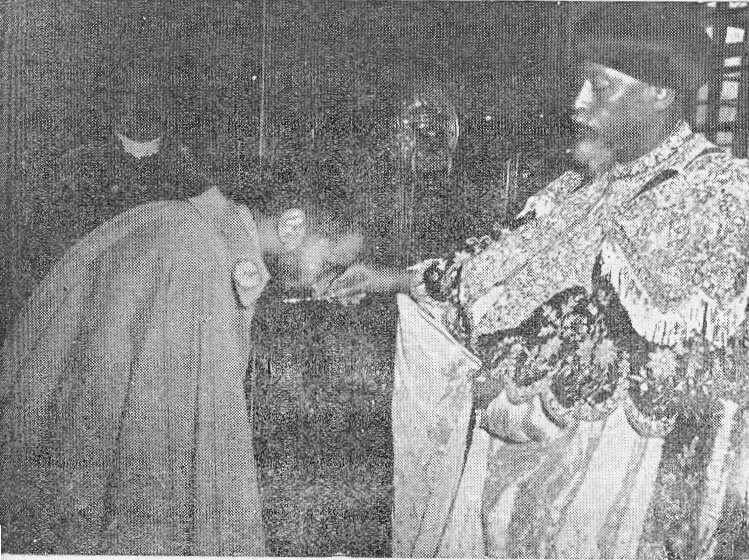 Greeting: In the case of the bishop, you bow and touch the floor, then kiss his hand; in the case of the priest, you bow slightly at the waist and kiss his hand. Name: A bishop is addressed as Hasyo. A celibate or married priest is referred to as Awun or Aboun (father) or sometimes Qashisho or Qasho (presbyter). 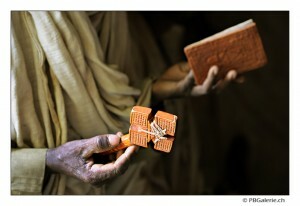 Greeting: When you greet a bishop, you say Barekmor (master, bless) and kiss his cross. When you greet a priest, there is no gesture. Name: A bishop is addressed at Thirumeni (pronounciation: Thi – roo- many). A priest is addressed as Achen. A deacon is addressed as Shemassen. 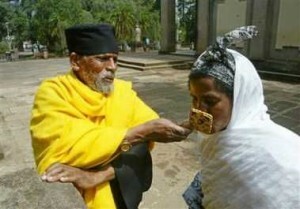 Greeting: When you greet a bishop, you say Barekmor and kiss his cross. When you greet a priest, there is no gesture. 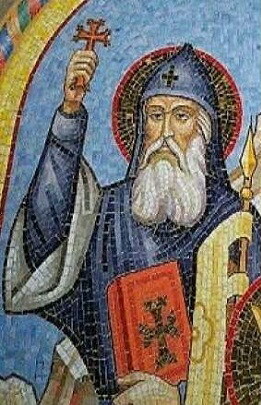 Name: A bishop is addressed as Abbatachin (our father). A monastic priest is addressed as Abba. A married priest is addressed as Kesis. 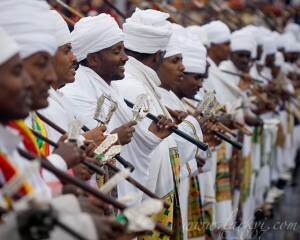 In addition to the “standard” priestly titles, the Ethiopian and Church also employs certain honorifics for priests of rank such as “Melake Selam” (Angel of Peace), “Melake Ganet” (Angel of Paradise), and “Melake Birhan” (Angel of Light).